"Mars" is the first planet beyond "Earth" moving away from the "Sun". While the orbit of Mars is nearly circular, it is somewhat more eccentric than the orbits of the other planets. Mars is more than 30 million miles farther, from the Sun, during some parts of it's year, than it is at others. Mars takes 687 of our days (that's slightly less than 2 of our years) to make one circuit around the Sun, traveling at about 54,000 miles per hour. Mars rotates at about the same speed as Earth - 24 hours and 37 minutes. Mars' average distance from the Sun has been calculated at 141 million miles, so the temperature on Mars would be much lower than on Earth even if the atmosphere were the same as ours. Mars does not have a magnetic field as Earth does, and because of this Mars is continually exposed to an influx of cosmic radiation 100 times as intense as on Earth, even though Mars is farther from the Sun than Earth. Where the atmosphere is well mixed by turbulence (below an altitude of 125 km [78 miles]), 95.3 percent of the atmosphere by weight is carbon dioxide. This is a comparatively large amount of carbon dioxide, nine times the quantity now in the Earth's much more massive atmosphere. However, much of the Earth's carbon dioxide is chemically locked in sedimentary rocks; Martian carbon dioxide is less than 1/1,000 the terrestrial total. 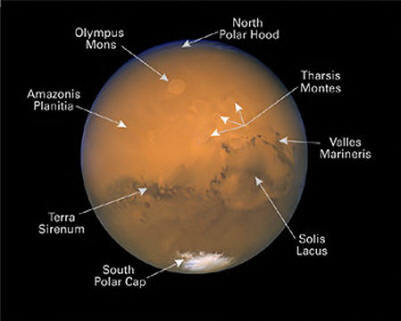 The balance of the Martian atmosphere consists of molecular nitrogen (N2), argon (Ar), water vapor (H2O), and rare gases. In addition to these molecules, there are also trace amounts of gases that have been produced from the primary constituents by photochemical reactions, generally high in the atmosphere; this component includes molecular oxygen (O2), carbon monoxide (CO), nitric oxide (NO), and small amounts of ozone (O3). One of the volcanic features is "Olympus Mons", a volcano whose caldera is over 50 miles wide, with the outer slopes measuring 300 miles in diameter. When you cool carbon dioxide gas down to 110 degrees below zero "Dry Ice" begins to form. 10 times longer and 3 times deeper than the "Grand Canyon". Mars has two satellites. The outer satellite, "Deimos", revolves around Mars in about 31 hours. 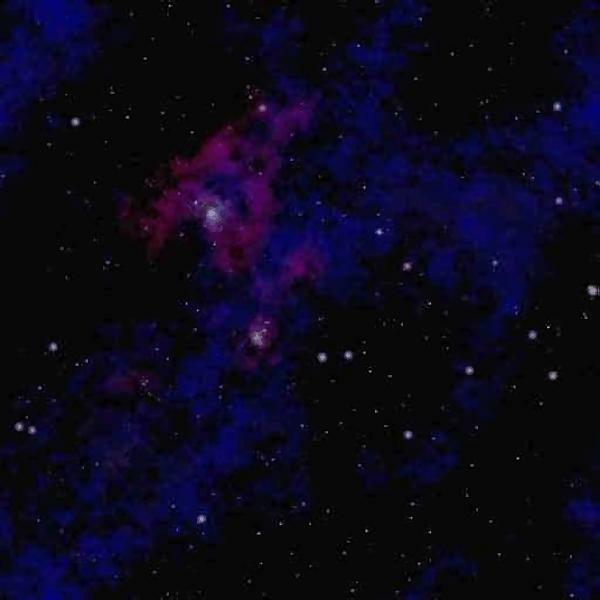 "Deimos" is about 5 by 7.5 miles in size. 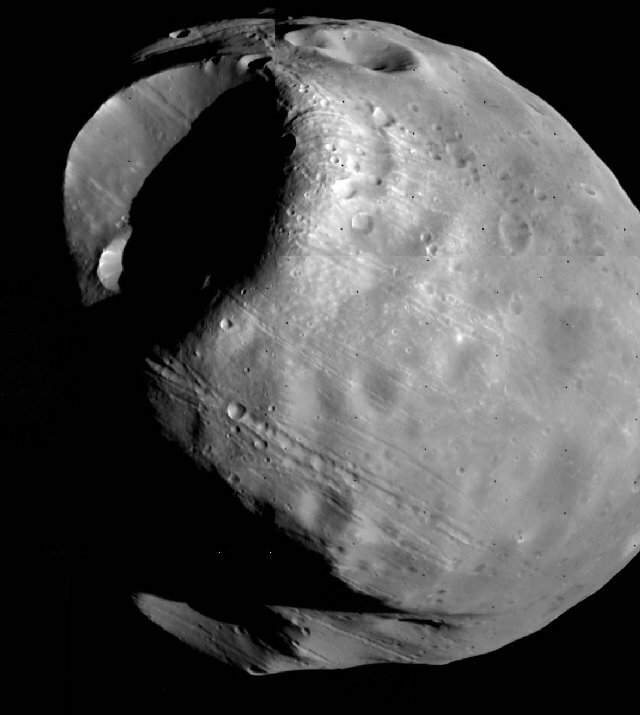 The inner satellite, "Phobos", whips around Mars in 7+ hours, making 3 trips around the planet each Martian day. 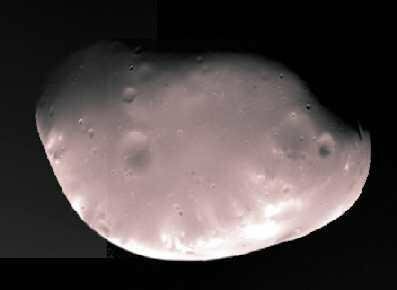 "Phobos" measures about 8 by 12 miles in size.